Paper Towel Holder New Vintage Old-Fashioned Mixer AdorableBlack/White/Silver Mixer Brand New Here's a Real Blast From the Past!!! Here's an Adorable, Wooden, Paper Towel Holder, that's made to replicate an Old-fashioned, Vintage, Standing Mixer with Stainless Steel Mixing Bowl. 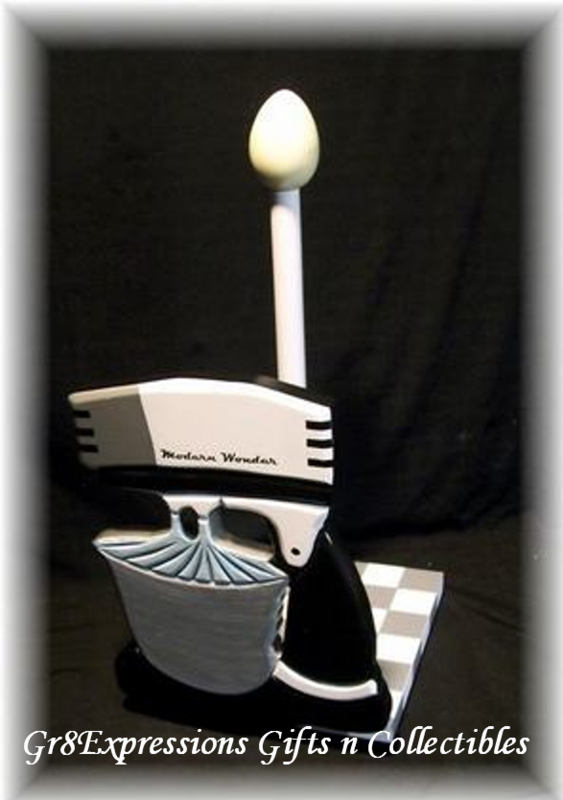 The Mixer is in Great Retro Colors, such as: Black, White and Silver and has the Text "Modern Wonder" written across it. This Paper Towel Holder has a Square Base with a Silver and White Checkerboard Print, and it is Topped off with an Ivory colored Egg-shaped Finial at the Top of the Dowel Rod that holds your Towels. It is removable, by unscrewing it from the Dowel Rod, for adding and removing your Paper Towels and Empty Rolls. This Piece measures 13 3/4" High (with the Dowel Rod, Paper Towel Holder) and 9" High with just the Decorative Vintage Mixer portion of the Piece x 6 1/2" Wide (across the Front) x 7" Deep (from Front to Back). What a Terrific Piece to add to your Vintage/Retro Kitchen!!! This Wonderul, Piece would also make an Excellent Christmas Gift or a Great Gift for any occasion all year through!! !